Are you ready for an enormous challenge? 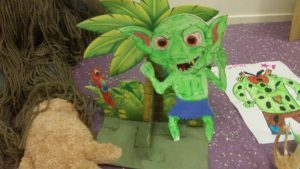 For your holiday homework we would like you to make a chair that is suitable for the BFG. 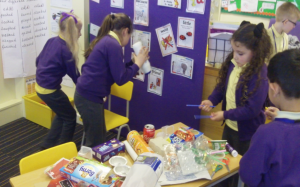 Please remember to use recyclable, child friendly materials such as empty plastic pop bottles/milk cartons, cereal boxes, newspaper, cardboard boxes and cardboard tubes. 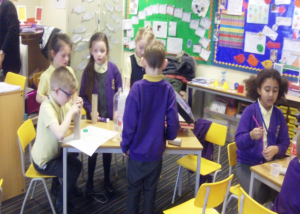 Can you make your chair as strong as a house? We wish you a happy and safe Easter. The BFG is looking forward to testing your chairs. Please spend some time reading with your child at home. 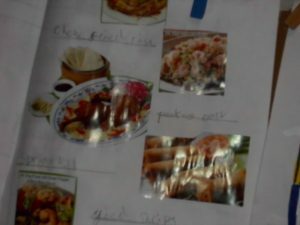 Within the white reading journal, there are some activities that you can complete about the book that you are reading. Please select 2 activities to complete during the holidays and tick/initial activities already completed. After Easter we will be reading the BFG by Roald Dahl. 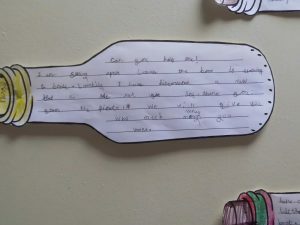 Write instructions about how to make your BFG chair. 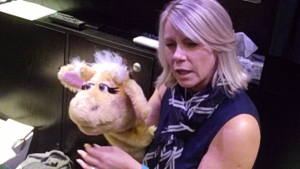 Remember to use imperative verbs (bossy action words) and a safety tip. We wish you a safe and happy Easter. 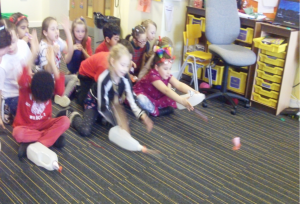 We used our BLP muscles to work together to design our Moon Buggies so they were able to carry an astronaut. 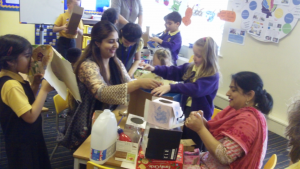 We used recycled materials to make our Moon Buggies. 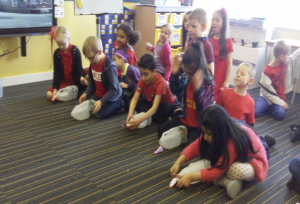 We collaborated to make our Moon Buggies. 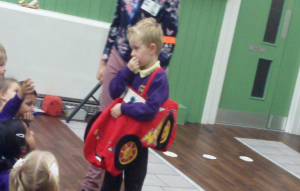 We used our perseverance muscle to help us complete our buggies. 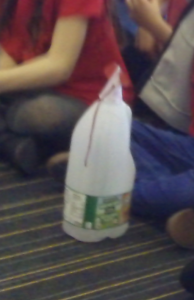 If you change how hard you squeeze a plastic milk bottle, will an object launch further in the air? Most of us predicted that the harder the squeeze, the further the mouse would travel. We found out if we shot our mouse across the floor they travelled further. 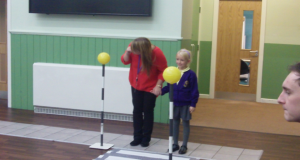 Eeisa’s mouse went the furthest. When jumped on the bottle the mouse travelled even further! 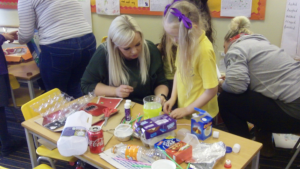 The Year 2 team would like to say a BIG thank you to the families who took some time during their half term holiday to prepare for our trip into SPACE and BEYOND! 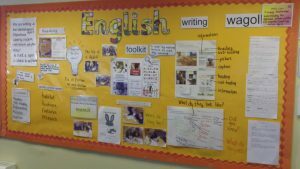 Below is a glimpse into some of our wonderful learning through our ‘Challenge Curriculum’. WOW! 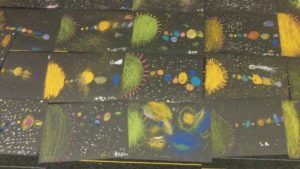 Look at some of our incredible pastel space pictures. 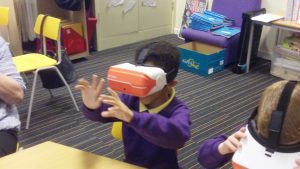 AMAZING views from outer space using Virtual Reality! 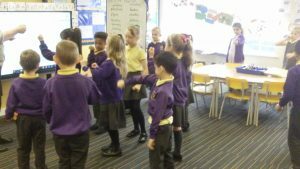 Moving like an Alien to Space sounds! Pack Your Bag, You’re Going to the Moon! Imagine you are going on a space mission to the Moon. How would you show people what it was like? Draw and label all the items you would take with you on your space mission. You are only allowed 10 things, so make sure they are worth taking. 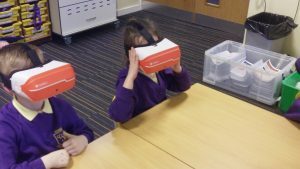 This half term our Learning Journey has taken us all over the World. migrating to another place and finally back home. 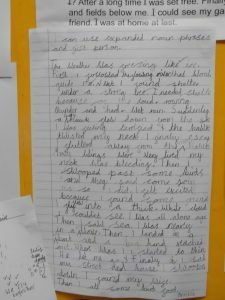 Look at some of our amazing writing. 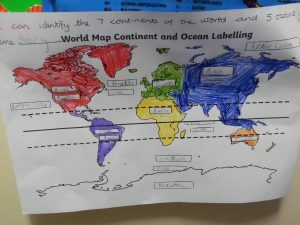 Through our Geography topic we went on a voyage to discover the ‘New World’ with Christopher Columbus. Just like Christopher Columbus our ships entered a severe storm. 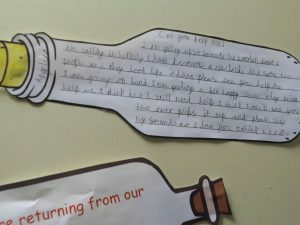 We had to write our own message in a bottle about our voyage and how we felt. 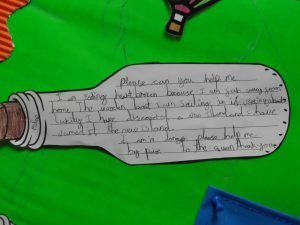 This is our message in a bottle. 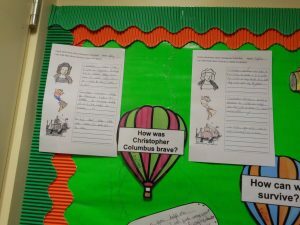 Christopher Columbus was very brave. 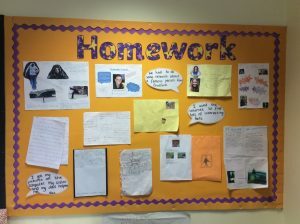 Thank you for your lovely homework. 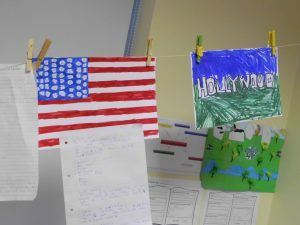 The year 2 team are delighted wit the wonderful pieces of homework that have been completed about different Countries. 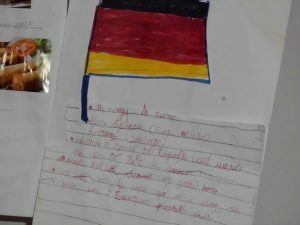 We have some really informative factual pieces of work. 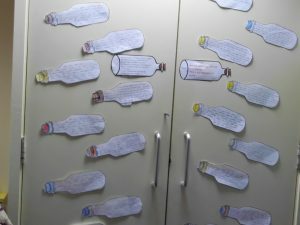 The homework completed will really help to develop a better understanding of our topic of Around the World in 80 Days. 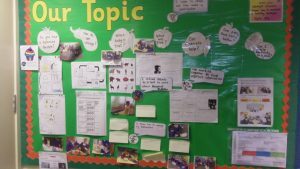 The Year 2 teachers would like to thank all the parents and carers for the help and input the children have had into their homework. Around the world in 80 days? 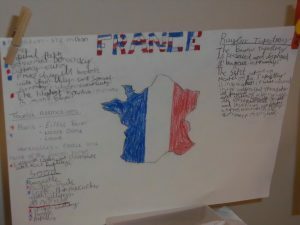 Carry out some research about a country. 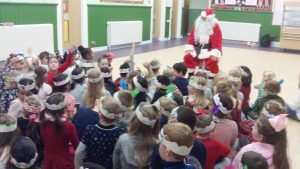 Santa came to our party. 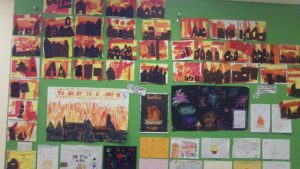 Look at some our amazing work. 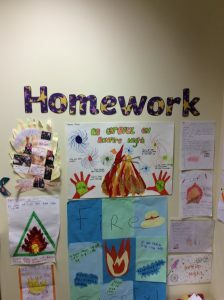 A HUGE thank you to all children and families who have created some fantastic FIRE homework! 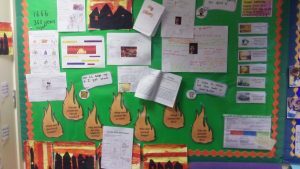 Carry out some research about the Fire of London. 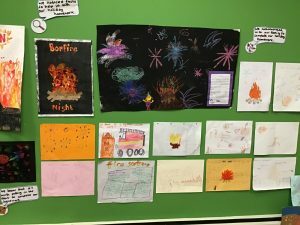 For your homework we would like you to research and create a magnificent poster about fire. 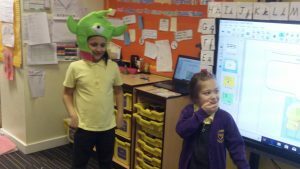 Mathletics – Don’t forget to keep going on it! 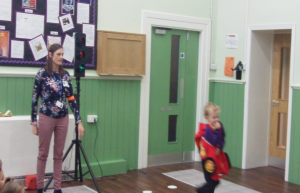 You can still achieve certificates over the holidays! 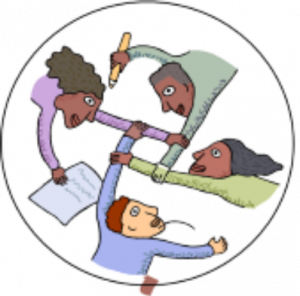 Reading journals – Please try to complete your task during the holidays! We will try and do something everyday to make us HAPPY! We hope you had a great summer holiday and enjoyed the break. 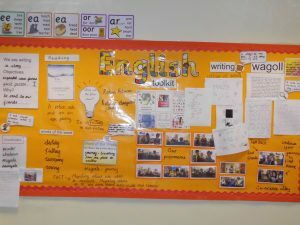 We have made a fantastic start to the year. 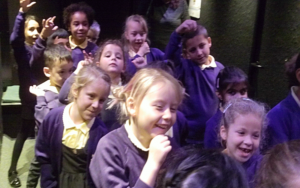 The children have returned with a good attitude and ready to learn. 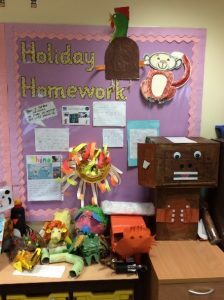 Thank you for the fantastic holiday homework. 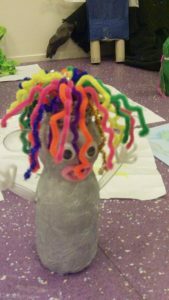 We loved looking at all of the trolls you have created. 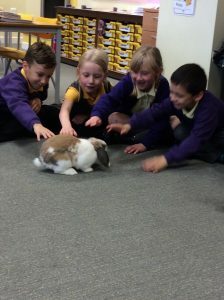 This half term our topic is all about animals. 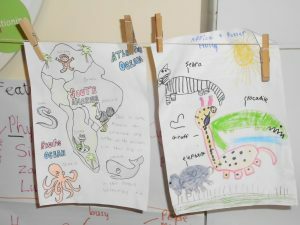 We will be looking at the changes animals make from baby to adult, what they need to survive and classifying animals. We will be focusing on place value, addition and subtraction in maths. 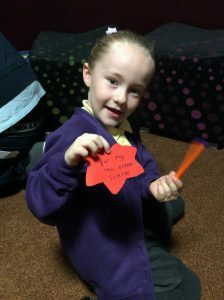 Please remember that Mathletics is a great way to support your child’s learning and progress. Just a big a reminder to read with your child regularly at home. 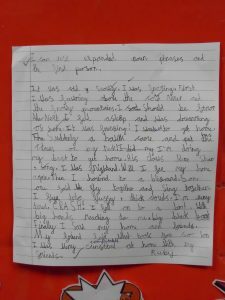 We would appreciate if you would comment in the reading log as this will enable your child to change their book. Your child will have a copy of the key instant recall facts for summer 1. 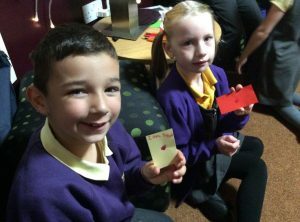 This is to practise reading time using analogue clock. 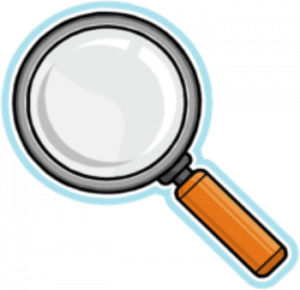 Mathletics – Just a reminder your child is set a Mathletics activity every week. 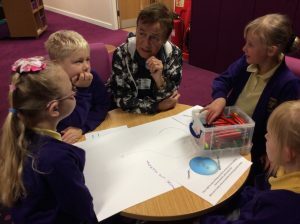 For those who cannot access Mathletics we run a Mathletics club during the week. 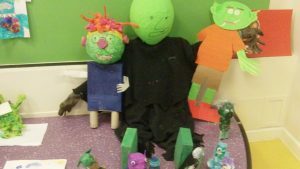 For your holiday homework we would like you to make a chair for the BFG as we will be learning about material and their properties in Science. Think about how you can make your chair strong and comfortable. 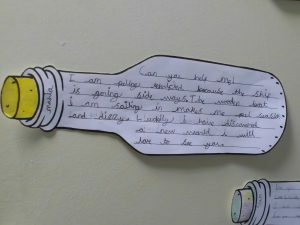 Please remember to use recyclable, child friendly materials such as empty plastic pop bottles/ milk cartons and cardboard tubes. We wish you a happy and safe Easter. The BFG is looking forward to testing your chairs. 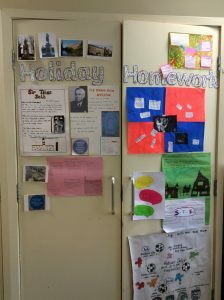 Next half term, our topic is all about Sir Titus Salt and we would like you to become researchers in the holiday! 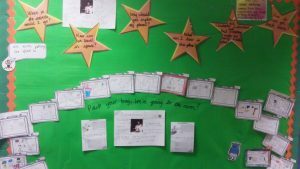 For your homework we would like you to use your BLP learning muscles to find out about a famous person in Bradford. 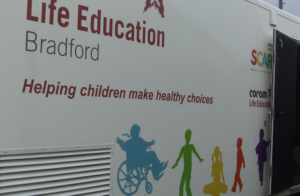 Why are they famous in Bradford? 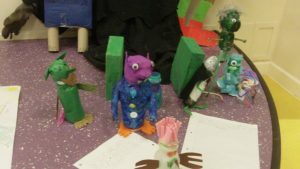 We will look forward to seeing your wonderful creations! 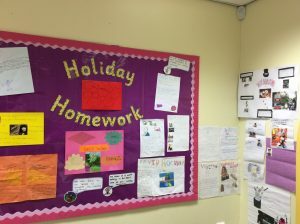 Thank you for all the holiday homework it was fantastic! 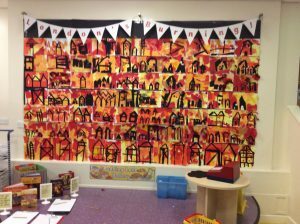 In our topic this half term we have been looking at collage. 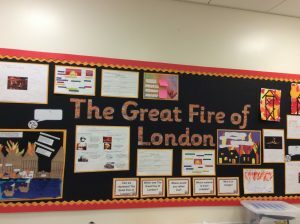 We represented the Great Fire of London using the skills that we have learnt. 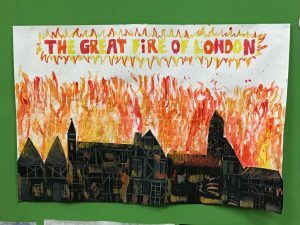 We have been reading non-fiction texts about the Great Fire of London. 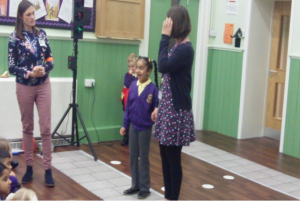 We have learnt lots of facts about the event and have used drama to act out the main events of the blaze. 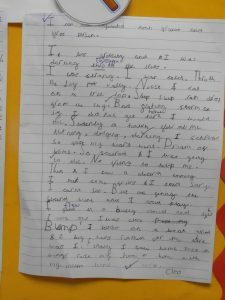 We will be using this to write our own diary entry. 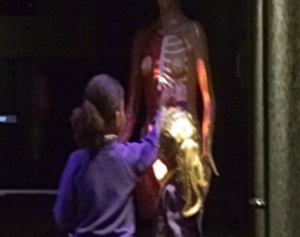 This week Year 2 have visited the Remembrance space to reflect and remember. 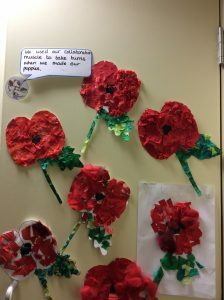 From this we made a poppy collage and have made remembrance day poems. 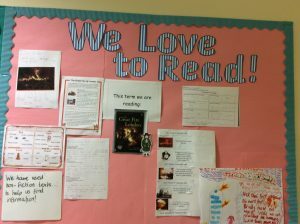 Just a reminder that the children can come and borrow a library book on a Monday or Tuesday lunchtime. 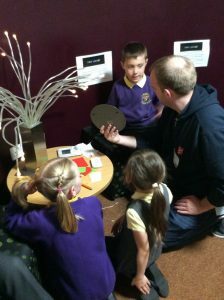 Mathletics club is still available to children who want to improve their maths skills on a Wednesday lunchtime. 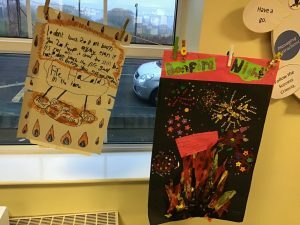 Next half term, we will be learning about fire and we would like you to become researchers during the holidays! 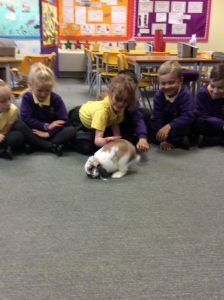 This week Year 2 had a visit from Buttons the rabbit. 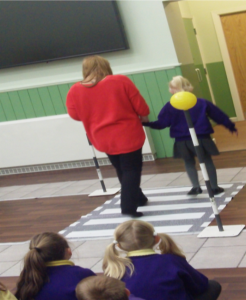 We know how to cross the road safely. 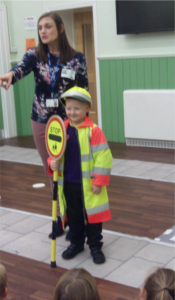 Mrs Little is our lollipop lady. Her job is to stop traffic and make sure it is safe to cross the road. 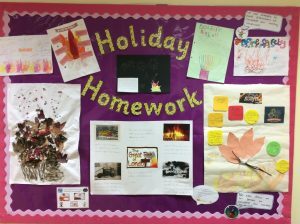 Thank you for the fantastic holiday homework. 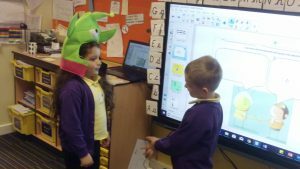 We loved looking at all of the animals you have created.